Cairo - The battle for Tripoli could ignite civil war on the scale of the 2011 uprising that toppled and killed longtime dictator Muammar Gaddafi. Inspired by the Arab Spring uprisings sweeping the region, Libyans rose up in February 2011 against Gaddafi, who responded with a fierce military crackdown. As the uprising quickly escalated into a civil war, Gaddafi massed tanks outside the eastern city of Benghazi and threatened to massacre the protesters street by street. Nato responded with a bombing campaign against Gaddafi’s forces, and eventually provided close air support to a loose alliance of rebel militias, helping them to drive him from power. The rebels captured Gaddafi in his home city of Sirte in October 2011 and killed him, later releasing video footage of him being beaten and humiliated. Libya held free elections the following year, but the government was powerless to control the vast array of militias, and the democratic transition stalled. 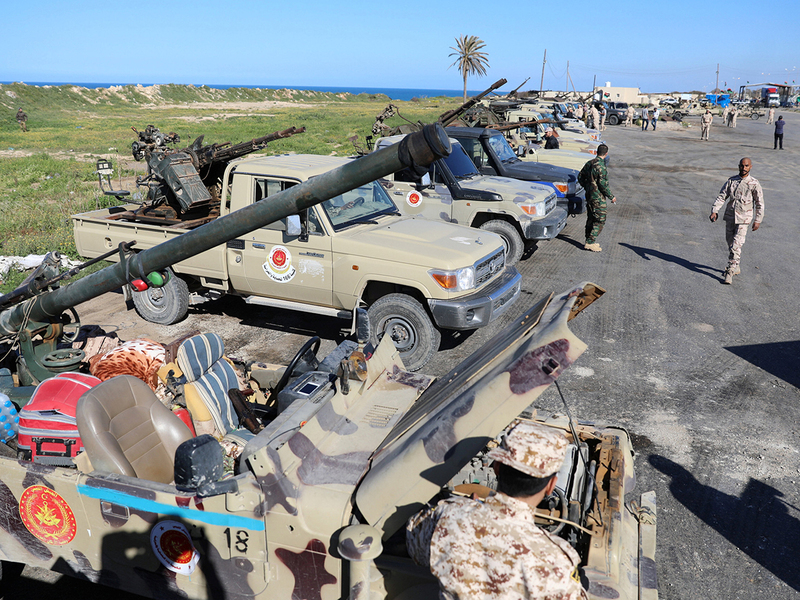 Fighting erupted in Tripoli in the summer of 2014, leaving the international airport largely destroyed and resulting in separate governments in the capital and in eastern Libya, each backed by various armed groups. In 2015, the UN backed the formation of a transitional government in Tripoli, in the west, under the leadership of technocrat Fayez Al Serraj. A separate government, based in the east and allied with Khalifa Haftar, has rejected its authority. Field Marshal Khalifa Haftar helped Gaddafi seize power in a 1969 coup against the monarchy and rose through the ranks of the military, eventually commanding Libyan forces in the 1973 Arab-Israeli war. But his reputation was left in tatters by Libya’s disastrous defeat in the war with Chad in the 1980s, in which he was among thousands captured. As the war wound down, he defected and joined the armed opposition to Gaddafi, orchestrating a number of failed coup attempts. He eventually relocated to the Washington, D.C. area, where he lived in exile for 20 years. He returned to Libya in 2011 and commanded forces during the uprising against Gaddafi. But he soured on the revolution during the chaos following the dictator’s death, and soon organised a campaign against the various Islamic militant groups that took root in eastern Libya. In recent years he has fought a series of battles there, retaking most of eastern Libya and its vital oil facilities. Over the last few months he has quietly expanded his influence across the south, winning over local tribes and factions. 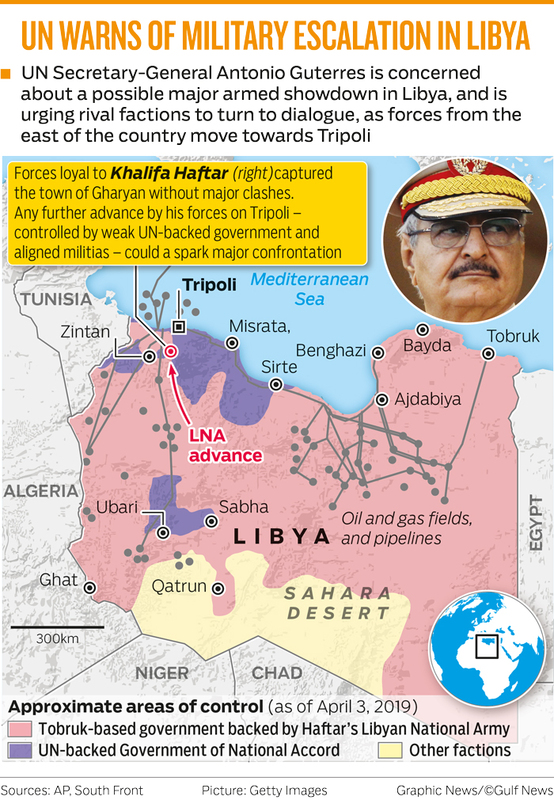 Haftar is expected to face stiff resistance from powerful militias from the western cities of Misrata and Zawiya, two areas that saw heavy fighting during the 2011 uprising. The Zawiya militias captured 100 of Haftar’s forces on Friday, the day after he launched his offensive. The battle-hardened Misratans led the fight against a Daesh affiliate in 2016, eventually driving it from its last stronghold in Sirte with US air support. They have received support from Turkey and Qatar.